The Nestle Gerber Good Start Gentle Formula RTF Tetra Pak Each, Model #5000056892, is anchored in advanced science and research. Nestle Healthcare Nutrition offers nutritional solutions for people with specific dietary needs related to illness, disease states or the special challenges of different life stages. 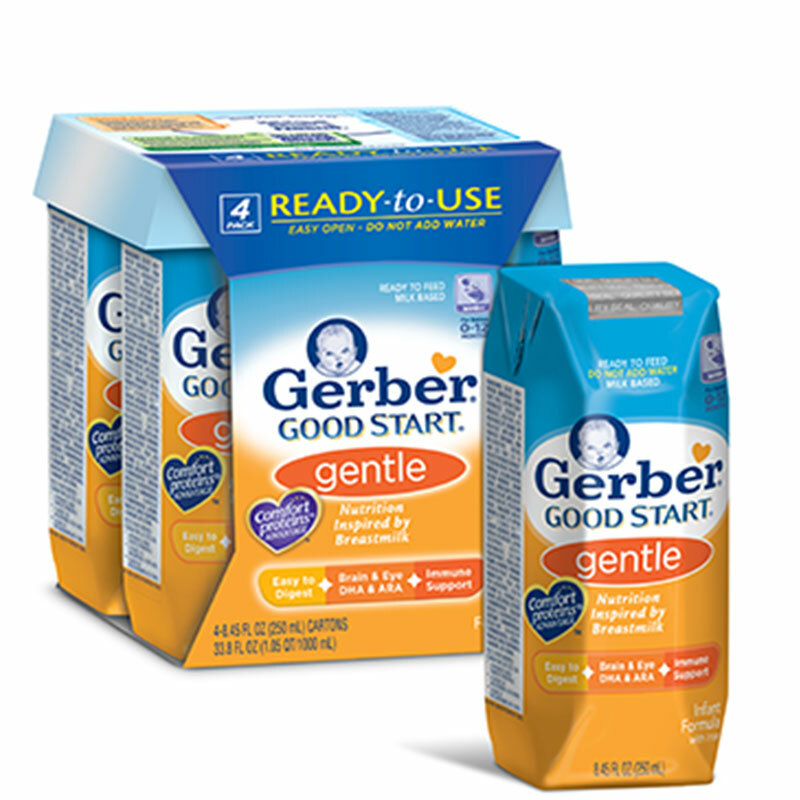 The Nestle Gerber Good Start Gentle Formula RTF Tetra Pak Each is not only inspired by how the nutrition of breastmilk supports healthy growth and development, but also how gentle it is on your baby's developing body. Since the digestive system is still developing throughout the first year of life, it is important to provide nutrition that is gentle for your baby. Nutrition for babies 0-12 months. Comfort Proteins - Small proteins for little tummies that are easy to digest and promote soft stools. Expert recommended DHA for brain and eye development. Complete nutrition with Iron and antioxidants similar to those found in breastmilk for healthy development. May help reduce the risk of developing atopic dermatitis for some babies. Ingredients: WATER, WHEY PROTEIN CONCENTRATE (FROM COW'S MILK, ENZYMATICALLY HYDROLYZED, REDUCED IN MINERALS), VEGETABLE OILS (PALM OLEIN, SOY, COCONUT, AND HIGH-OLEIC SAFFLOWER OR HIGH-OLEIC SUNFLOWER), CORN MALTODEXTRIN, LACTOSE, AND LESS THAN 1.5% OF: GALACTO-OLIGOSACCHARIDES*, POTASSIUM CITRATE, POTASSIUM PHOSPHATE, CALCIUM CHLORIDE, CALCIUM PHOSPHATE, SODIUM CITRATE, MAGNESIUM CHLORIDE, FERROUS SULFATE, ZINC SULFATE, COPPER SULFATE, POTASSIUM IODIDE, MANGANESE SULFATE, SODIUM SELENATE, M. ALPINA OIL**, C. COHNII OIL***, SODIUM ASCORBATE, INOSITOL, CHOLINE BITARTRATE, ALPHA-TOCOPHERYL ACETATE, NIACINAMIDE, CALCIUM PANTOTHENATE, RIBOFLAVIN, VITAMIN A PALMITATE, PYRIDOXINE HYDROCHLORIDE, THIAMINE MONONITRATE, FOLIC ACID, PHYLLOQUINONE, BIOTIN, VITAMIN D3, VITAMIN B12, TAURINE, NUCLEOTIDES (CYTIDINE 5'-MONOPHOSPHATE, DISODIUM URIDINE 5'-MONOPHOSPHATE, ADENOSINE 5'-MONOPHOSPHATE, DISODIUM GUANOSINE 5'-MONOPHOSPHATE), ASCORBYL PALMITATE, MIXED TOCOPHEROLS, L-CARNITINE, SOY LECITHIN. *A Prebiotic sourced from milk.